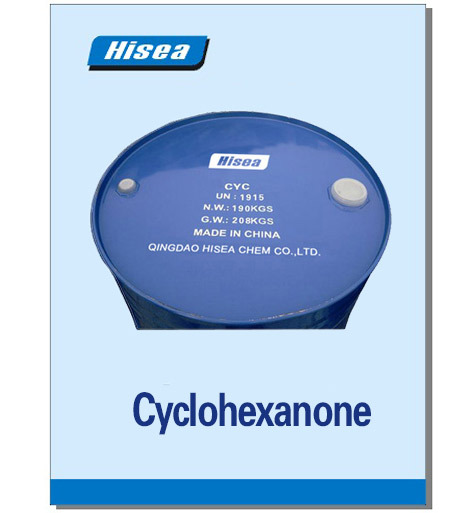 Cyclohexanone is the organiccompound with the formula(CH2)5CO. The molecule consists of six-carbon cyclic molecule with ketone a functional group. This colorless oil has an odor reminiscent of peardrop sweetsas well as acetone.Over time, samples assume a yellow color due to oxidation. Cyclohexanone isslightly soluble in water and miscible with common organic solvents. Billionsof kilograms are produced annually, mainly as a precursor to nylon. This process can also be adjustedto favor the formation of cyclohexanol. Cyclohexanone can be preparedfrom cyclohexanol by oxidation with chromiumtrioxide (Jones oxidation). An alternative methodutilizes the safer and more readily available oxidant sodium hypochlorite. Like cyclohexanol,cyclohexanone is not carcinogenic and is only moderately toxic, with a TLV of 25 ppm for the vapor. It is anirritant. A recent study of plastic tubingused in medical procedures that circulate blood outside the body suggests alink between this compound and decreased heart function, swelling, loss oftaste and short term memory loss.